It’s been a long time since the original 10 members of Meow Wolf’s art collective had to scrounge in dumpsters for the raw materials to bring their galaxy-spanning visions to life. Now, with well over $18 million in financing behind them, the story of a troupe of misunderstood, hardscrabble artists trying to create something unique in an unlikely corner of the U.S. has morphed into a vision of corporate aspirations that span the nation — and potentially the globe — with help from some of the largest technology companies in the world, like Microsoft . As part of its move beyond immersive experiential content into two-dimensional and three-dimensional virtual storytelling, Meow Wolf is now harnessing Microsoft’s volumetric capture technologies to record characters and aspects of its performances and make them digital. That’ll be important as the company looks to take its show on the road. The company has plans to launch new versions of its shows in Las Vegas, Denver and Washington. “In terms for this collaboration it’s R&D to be distributed across our network,” says Nicolas Gonda, EVP of Entertainment at Meow Wolf. For Microsoft, the installation of its volumetric capture technology is the first time that the Seattle company has brought its technology out of its own studios. In the Meow Wolf space at the converted bowling alley George R.R. Martin’s capital helped acquire, Microsoft’s capture technology will be situated in “an area thematically tied in to the Meow Wolf experience,” says Mixed Reality Capture Studios general manager Steve Sullivan. “Whenever we interact with audiences — whether through location-based entertainment, television shows, feature films, podcasts or any other medium we employ — we treat them as participants within our stories and provide them with agency,” wrote Gonda, in an email. 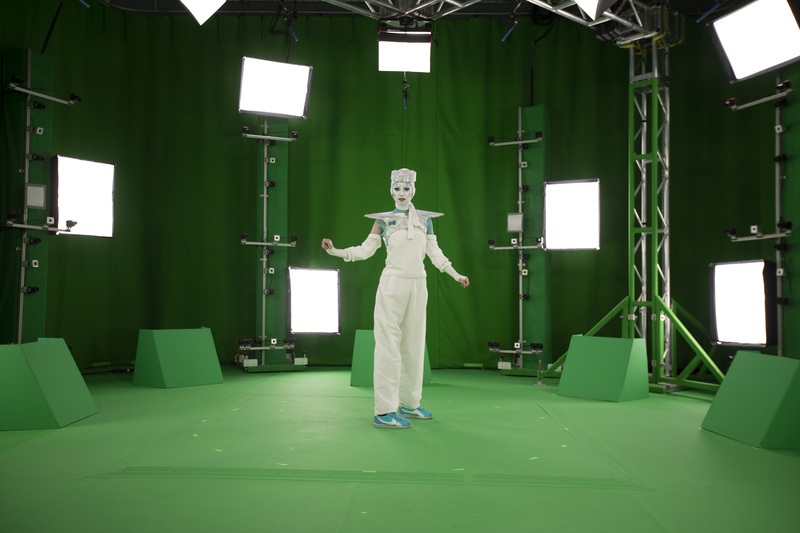 Through the volumetric capture tech that Microsoft is bringing to the table, Meow Wolf will be looking to capture its characters and performers and bring them into other media. “Volumetric technology gives us the tools to have more characters in the space, and blend physical and digital worlds more seamlessly, in ways that are novel and unexpected. Imagine interacting with a digital character and having the same performer physically step into the space,” Gonda wrote. That means an easy pipeline for bringing Meow Wolf characters into extended reality, mobile devices, digital screens for short-form video content and holograms in spaces that aren’t purpose-built by Meow Wolf to be immersive, according to Gonda. The volumetric tech also can be used for merch — the lifeblood of any artistic endeavor these days. Whether you’re selling a painting or a T-shirt at a concert, that’s where the money gets made. “Our Digital Storytelling initiative involves adding a layer of digital characters and experiences throughout our physical exhibition spaces,” according to Gonda. “We are researching and developing new vehicles for delivering personalized, playful experiences that invite visitors to dive even deeper into the Meow Wolf Multiverse by becoming active participants.” That means distribution through a digital app as digital avatars or 3D-printed souvenirs after a show, according to Gonda. What Microsoft is bringing to Meow Wolf is a version of its 106-camera, four-microphone, green-screened setup to capture audio and video in a space that’s roughly 25 by 25 feet. The cameras, split between infrared and RGB units, capture color, shape and texture at 30 to 60 frames per second and require 10 gigabits per second of processing power. Once the images are captured, a series of computer vision algorithms and geometric meshing algorithms convert roughly 10 seconds of video into a final, volumetric three-dimensional hologram compressed to 10 megabits per second for playback. Microsoft has been working on volumetric capture since 2010, when the company launched the Kinect . The recently revitalized brand was resuscitated last year for business uses, but the tech also lives on in Microsoft’s experiments with holograms for virtual and augmented reality as it looks to bring more functionality to the HoloLens product — and beyond. “We are seeing us as trying to support mixed reality in general,” Sullivan told Variety last year. Meow Wolf is definitely mixed reality — in general. The evolution of the art collective into a burgeoning corporate enterprise with national ambitions is mirrored in a general commodification of their kind of pop installation art aesthetic into pop-up shops and experiential entertainment. What began as an attempt at creating a weird, slightly wacky forum for artistic expression managed to gain popularity at just the right moment when the broader culture was shifting to more “experience-based” diversions that are less focused on naked consumption. That’s one reason why Meow Wolf has managed to capture several millions of dollars in venture capital funding from real estate developers like Fisher Brothers and the startup investment firm Alsop Louie — along with its initial cash infusion from George R.R. Martin, arguably New Mexico’s most famous living celebrity (with apologies to The Shins). Meow Wolf also makes money (another attractive quality in a venture investment). The company’s stew of pseudo avant-garde futurism and bric a brac, DIY amusement park on acid brand of immersive entertainment raked in $7 million in 2017, according to a May 2018 filing with the Securities and Exchange Commission. In some ways, the company is perfectly positioned to ride the cresting wave of interest in the intersection of digital worlds, virtual avatars, immersive entertainment and augmented reality. But is it still art? For some critics maybe it never was, and for some it’s the future face of art. But, no matter its standing in the traditional art gallery circles, it is popular, and there’s a definite aesthetic to what Meow Wolf is trying to do. Some local artists in the communities that Meow Wolf is trying to colonize are pushing back against the company’s forays into their communities. Denver’s local scene has criticized the company’s move as another brick in the gentrifying walling off of formerly inexpensive areas now being overrun with developers as America’s second cities get their renaissance. And in some ways Meow Wolf is extending that renaissance to the creative communities that exist in these spaces. The company does pay artists to work — and making a living wage as an artist in America is hard in normal times, let alone when what little public funding there is for the arts is under siege. “We’d like Meow Wolf to be the largest employer of artists in the world,” VP of experience design Corvas Brinkerhoff, told Rolling Stone. In Denver, that means 40 percent of the art in Meow Wolf’s local project there would come from local artists — a commitment that the company told Rolling Stone it would try to replicate at its other locations in the cities it’s hoping to operate in. The company has also set up a fund to give money to DIY arts spaces in other cities where such communities exist.